Just curious if there is any way to transfer saves from an IFU-30 onto this thing? Like for example with a tennokoe bank card? First, plug your IFU and tennokoe bank and transfer the save from IFU to tennokoe. Then, plug your SSDS3 and tennokoe bank and transfer the save from tennokoe to the SSDS3. This will save the data in a file named backup.bup in the BUP directory. Then it's recommended that you have a save file created in the SD for the game you want to import (load the game and do anything that causes the game to save), that way it's easier to know the name of the file (it's the hucard file name without .pce and adding .bup, or the cd directory name adding .bup). Make a copy of backup.bup and rename it to the file save file name for the game (or games) you want to use that save for. If you don't use per game save file, you just need to to the first 2 steps, copy from IFU to tennokoe, and then from tennokoe to SSDS3. It's also included in each box. Yes, for Arcade Card games you just need the 3.0 system bios . I'm not sure about using a physical 3.0 + internal arcade card. I'd say they should work, and if they don't, that can be fixed by a firmware update. Also, keep in mind that if a hucard is inserted (bios card or game), you can't enter the menu to switch games, or use the per-game save feature, because the card takes control of the bus on boot, and the SSDS3 never has a chance to run its own code. I can see the Games Express CD Card bios being mentioned in the manual, so I assume the Games Express CD games will work then ? Is the 'game database' application released yet or was that not planned for the product launch? - The package felt extremely polished. I love the box material - the print is vibrant and the box has a nice feel to it. It's hard to describe, but I'm sure others will feel the same. The plastic case is equally impressive. It feels like something a multinational corporation would produce. I really like the frosted transparent look. 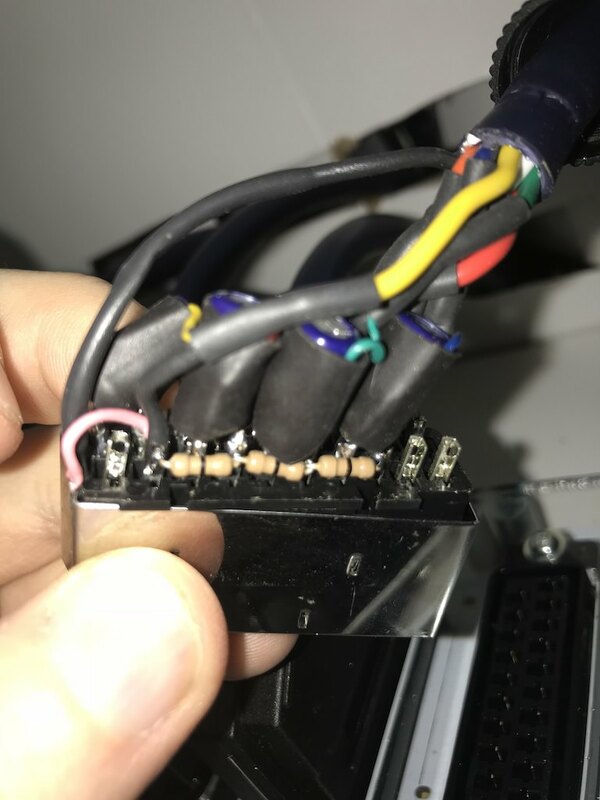 - I initially hooked up my Genesis 2 csync cable (from Retro Access, with the 470 ohm resistor and 220 uf cap) and I had sync issues. On my Sony consumer CRT, it mostly worked, but the Konami screen caused the image to drop briefly. On my Sony PVM, it wouldn't sync at all. I then tried my older composite video cable (also from Retro Access) and that worked great. I'm not sure if something in my csync cable is out of spec or what, but I'm interested in others' experiences. FWIW, I didn't notice any interference with the composite video one, so I may just use that (although it might not be long enough for where I was planning to place this system - ugh). - I wasn't sure how to lay out the CD-ROM images, so I put a few games in a single folder. Don't do that - put one game (and all its associated files) per folder. Fortunately, Rondo of Blood was the first game in the folder, so that's what I got to test. The CD experience was flawless. I did notice the access light on the SSDS3 flickering. I thought that was a fantastic touch. - Others were commenting on the menu graphics and a desire for a more vanilla menu. I prefer the more polished look of the SD2SNES over Krikzz's menus, so I was expecting to like this menu and I do. It feels quite polished. If it had a catchy chip tune, I don't think I would mind (I have fond memories of the SWCDX's menu song from the SNES era). I'll need to do some more testing in the coming days, but overall I like what I've seen so far. Thanks, I actually was just reading that thread. What skill level is needed for soldering surface mount caps? I'm a novice when it comes to soldering. Yes, you can, using a tennokoe bank. It's not too difficult, when removing the caps hold the tip so that it is heating both ends and just slide it off. Here is a video of voultar doing some SMD stuff: link. Are you using any kind of sync cleaner on the csync version of the MD2 cable. I was about to order a MD2 cable and was planning on going csync as well for my PVM. I do use a sync cleaner on it though. This csync cable was from mid 2017. I look forward to hearing what others' experiences are with this. Like I had said, it's possible my cable is the problem. Does this cable work on your Genesis 2 with your PVM? What model PVM do you have? Yes, the Genesis 2 works on my Sony 1954Q PVM with the csync cable. you could post the pictures here. there was some other thread for "cable issues" and the like so of course they punished you for posting in the wrong thread. but posting pics of someone unzipping their pants is ok. that forum is something else. lol. im wondering if a c-scync cable wasnt tested by them as they didnt know what components were in their normal cable. i dont recall them saying they tried another cable besides that one. Yes, we tried with a cable wired for csync and worked fine in all our tvs/monitors. I ll try to make some signal captures tomorrow to ensure it's still ok. The output is currently 0-5V levels so it will need to be attenuated before feeding to a 75ohm video input. A 470ohm resistor in the cable will reduce it to 0-0.7V . The composite sync signal is negative polarity, with hsync pulses during vblank. Still may be worth opening it up to see if the 7314 is in there. I think this was only brought to their attention around that time last year. In fact, I just looked up a vid Voultar posted about it (https://www.youtube.com/watch?v=khl6x0S_bV0) and that was from July. Again, I don't know if that may be causing an issue, but prob worth it to open it up and see what you have. I opened the csync cable tonight and didn't see anything unusual. No evidence of anything except for caps and resistors in the SCART head. Picture below. 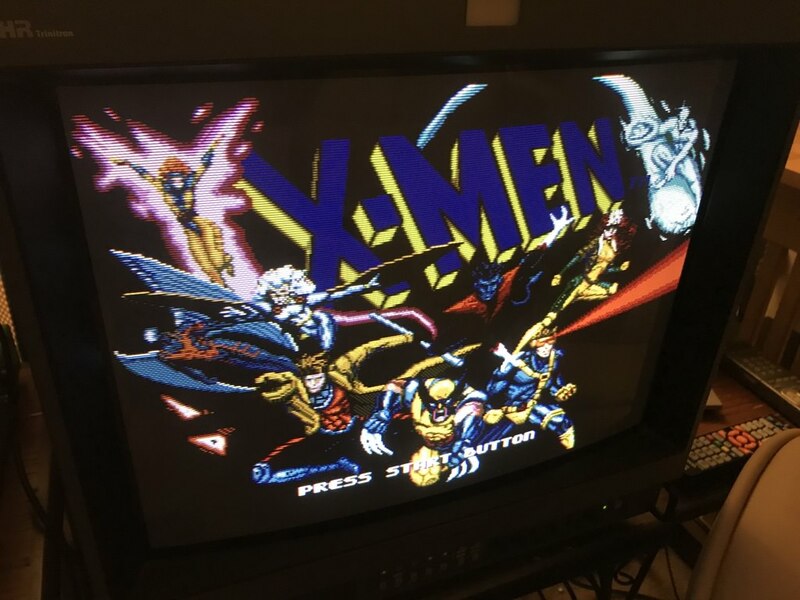 Also included a shot of X-Men running on my PVM for posterity. As I've stressed, the Retro Access composite video cable is working quite well. I'm in no way attempting to be alarmist or accusatory - just interested in figuring out what might be wrong. As others SSDS3 units arrive, please let me know how things go with your csync cables. Yeah, cable looks good, at least from what I can tell with the heat shrink on. You only mentioned two CRTs, did you try on an OSSC/Framemeister etc.? Seems to work great. I can't fully evaluate it yet because the cabling discussion that dragged on for so long made me order mine pretty late and it isn't here yet. So I can't hear CD redbook audio / PCM sounds and can't use the RGB out. HuCard games work & sound fine and CD games seem to work properly as well, apart from the audio I can't hear since I'm using the wrong AV-port, obviously. Also A++ on the packaging. I've never owned a retro gaming product that had a box that I'd want to proudly display on my shelf / glass case. Very neat. - Is there any software for preparing the game database / metadata etc. yet? I tried to register an account for the download section on the site, but it just said my serial number is invalid. Is this only for the NeoSD downloads? - I find the button mapping for the menu utterly bizarre. You have a 2 face button controller and you map those two buttons to... nothing & options? That's like making a web browser where the left mouse button is unassigned and the right one clears the cache. I would've expected button I to be confirm/select and button II to be cancel/back. Instead of having an 'Up' entry in each folder it would be much easier to just hit the cancel/back button. You're not the only one having an issue with retro console accessories Csync cable, someone else did on Neo Geo as well. It is interesting your cable is the newer design without the amp though-- I think theirs is too. Must be something different about her csync cables. Last edited by FriendofSonic on Wed Jan 17, 2018 4:56 pm, edited 1 time in total. My newish csync cable from Retrogamingcables.co.uk isn't working with the unit either. Just getting NO SYNC on my OSSC. I think the downloads section is still not up. The tool is almost ready, and just needs a bit more testing to ensure it properly scans all games without issues. Ii think it will be ready this week. About the filenames scrolling on the bios screen, you are right. We didn't add it as it seemed to fit the current longest bios names, but that's something we can easily add. And about the buttons, we thought using the RUN button to launch a game was the best way, like you have to press RUN at the bios screen to start a cd game, or to select options in many games. The select button to switch hucard/cdroms also seemed logic for us. Using the II button for options was the same than for NeoSD where B is options/back from options, and then that left button I free, that we used for toggling and selecting options. You are right that going back a directory is harder that way, but I usually just hold Left till the top of the list and then RUN to go back. If you hold SELECT while powering on the system, the "skip press run" option will be temporarily disabled until you reset again, that way you can enter the backup ram manager in the bios by pressing SELECT at the "Press RUN" screen. Also, holding SELECT while the Super SD System 3 splash is shown, and until the game list appears, makes the list start in CDROM mode, instead of HuCard mode, avoiding the time it needs to scan the directory for hucards and then switching to CDs if you want to load a CD and have many files at the root directory.